Eastern Washington University (EWU) is a public university in Cheney, Washington, with programs offered at campuses in Cheney, EWU Spokane at the Riverpoint Campus and at multiple campus locations throughout the state. Founded in 1882, the university is academically divided into six colleges: Arts, Letters & Education; Business & Public Administration; Science, Technology, Engineering & Mathematics; Social Sciences; Health Science & Public Health; and University College. As of fall 2014, Eastern Washington University enrolled over 13,000 graduate and undergraduate students at both its Cheney and Spokane campuses. Eastern Washington University was established in 1882 by a $10,000 grant from expressman Benjamin Pierce Cheney, and was originally known as Benjamin P. Cheney Academy to honor its founder. In 1889 the school was renamed State Normal School at Cheney and in 1937 to Eastern Washington College of Education. The campus was almost totally destroyed twice by fire in 1891 and 1912, but was rebuilt each time. The school grew quickly in size following World War II and became Eastern Washington State College. During this era, Eastern added various graduate and undergraduate degree programs. In 1977, the school's name was changed for the final time to Eastern Washington University by the Washington State Legislature. In 1992, the core of the campus was listed on the National Register of Historic Places as the Washington State Normal School at Cheney Historic District. The main campus of Eastern Washington University is located in Cheney. A branch campus, known as the Riverpoint Campus is located in nearby Spokane and is shared with Washington State University. EWU also offers degree programs located in Bellevue, Everett, Seattle, Longview, and Vancouver (Washington). EWU offers over 100 fields of study, 10 master's degrees, seven graduate certificates, 55 graduate programs of study and an applied doctoral program of physical therapy. A master's in social work is offered in Everett and Vancouver, and a master's in education is available in Kent. A creative writing Master of Fine Arts, Interdisciplinary Studies, Child & Family Outreach Program, Communication Studies, Social Work Program (part-time Master's), Journalism, Alcohol & Drug Studies, and Counseling Education & Developmental Psychology programs are offered in Spokane. The Carnegie Foundation for the Advancement of Teaching classifies the university as Inclusive, since the university admitted eighty-two percent of those who applied to be freshmen in 2010. The average incoming freshman had a combined SAT score of 970 and a high-school weighted grade-point average (GPA) of 3.17 in 2010. 86% of freshmen in 2010 were from Washington. Institute for Public Policy & Economic Analysis—created in 2002 to "provide data and analysis about a variety of factors in the region that will be useful for businesses, communities and others as they plan for the future." Headed by Patrick Jones, Ph.D.
Women's & Gender Studies Center—Women's Studies programs at EWU empower women to achieve dignity and justice through education, scholarship, and social change. Eisenhower Center/International Field Study—A program designed for students to travel abroad while earning college credit. English Language Institute—ELI is committed to enabling qualified international students who have chosen to come to this program to integrate into the mainstream of higher education. Center for Farm Health & Safety—Conducts research and demonstration programs involving Health and Safety of Farm-based population groups. Fisheries Research Center— Performs a great variety of salmonid restoration studies including but not limited to: diet studies, population modeling, telemetry, bone regressions, bioenergetic modeling, water quality assessment, ecosystem modeling, surgical implantation of radio, acoustic and ultrasonic tags, and tributary sampling. The Pence Union Building, or PUB, has served as the community center for Eastern Washington University. In the past: Its mission was to provide the student-centered facilities and services required by the University Community. The PUB consistsed of three floors that house among other things the campus bookstore, student government offices (Associated Students of Eastern Washington University, or ASEWU), Baldy's dining facility, office of student life, numerous conference rooms and the Multipurpose Room (MPR), which is used for large-scale presentations and campus events. Now, the PUB is undergoing a $40M renovation. The renovation will use the footprint of the original building and will address areas of greatest need for students. As of March 2017[update], it is in the process of being deconstructed to its skeleton to be built back up. Aspects of the PUB have moved to various other areas on campus; Eagle Express Market and elements of Baldy's have moved to Tawanka Hall, ASEWU is now located in Sutton Hall, Student Life is in Sutton Hall. The PUB Computer Lab was split into two areas of concentration in JFK Library and Patterson Hall. The University Recreation Center, or URC, is a Three-Level 117,699-square-foot (10,934.6 m2) Recreational Facility that was opened on campus in 2008. The state-of-the-art facility boasts a 19,455-square-foot (1,807.4 m2) multi-purpose arena that can operate as an ice rink and general purpose sports floor, 30-foot (9.1 m) Indoor Climbing Wall with 11 routes (1 simulated Ice Climbing) & 2 bouldering walls, Indoor Parking Garage (40 Metered Spaces), 17,000-square-foot (1,600 m2) fitness Center & gymnasium, campus dining facility known as "The Roost" and a 2-Lane 200 Meter Running Track. The cost to build the URC was $26.3 million, an amount which was jointly funded by the university and by students through a $65 per quarter activity fee. $28.6 million in revenue bonds were issued by the university in order to build the facility and pay the costs of issuance. The university funds the center's annual operating costs as part of its general operating budget. The URC has been awarded the Leadership in Energy and Environmental Design (LEED) gold certification for its environmentally friendly construction. Eastern Washington University has eight residence halls, each with its own personality. Brewster Hall, built in 2002, houses students 19 years of age and older. Brewster is located squarely in downtown Cheney offering students increased accessibility to community resources and businesses. Located on the main floor of Brewster Hall is Brickhouse Deli, a specialty sandwich shop run by the university. Dressler Hall was built in 1966. It is conveniently located behind the Pence Union Building (PUB) and is the closest hall to the Phase and Athletic Center. The majority of residents are freshmen. Dressler's most popular residential program is an annual 3-on-3 basketball tournament. Dryden Hall was built in 1965 and is located one block from the Pence Union Building. This hall caters to a more mature population of residents 21 and over. Louise Anderson Hall, also known as LA Hall is centrally located directly across from the Pence Union Building (PUB) along Elm Street. The building was recently remodeled in 1999 and features a plethora of amenities found no where else on campus. Morrison Hall was built in 1970 and is located about one block from the center of campus. The singular circular tower Pearce Hall was built in 1964, and is the largest residence hall on campus. Pearce Hall is a community which is composed primarily of first-year students. snyamncut, EWU's newest residence hall, snyamncut (pronounced: sin-yam-en-suit), is the Salish word for place of gathering, with the connotation of it being a special place of emotional attachment-a place of the heart. It was a special meeting place for the Spokane Tribe, an area that was mainly used for rest, relaxation and decision-making. Streeter Hall opened in 1968; on the north side of campus, it is near three other residence halls and approximately one block from the Pence Union Building. EWU also has apartments for students with families, single graduate students, and single students older than 25. The three apartment complexes are Anna Maria, Holter House, and the Family Townhouses. The Easterner is the student newspaper of Eastern Washington University. The Easterner provides the latest campus news, sports and opinions to students, faculty, alumni and the surrounding community. All content in The Easterner is either produced or chosen by students from the university. The Easterner is distributed in print form during the fall, winter and spring quarters on a weekly basis throughout the Cheney campus, Cheney business district, and the Riverpoint Campus. The Easterner maintains an independent website  and Facebook page  from the university. The first student newspaper, "The State Normal School Journal", was published on October 10, 1916. The weekly publication changed its name to "The Easterner" in 1951. Northwest Boulevard is the literary journal of Eastern Washington University. It was founded on September 22, 1993. The Office of Student Activities oversees more than 100 student clubs and organizations on campus that cater to a wide variety of interests and activities. EWU is the only regional university in Washington that has an active Greek system on campus. As of the 2015–2016 school year, there are five IFC Fraternities, four NPC Sororities, five NPHC Chapters and eight NALFO Chapters that are currently active. The five IFC Fraternities are Beta Theta Pi, Pi Lambda Phi, Sigma Phi Epsilon, Kappa Sigma and Phi Delta Theta. The four NPC Sororities are Alpha Omicron Pi, Alpha Phi, Alpha Xi Delta, and Gamma Phi Beta. The eight NALFO Organizations are Lambda Theta Alpha, Kappa Delta Chi, Gamma Alpha Omega, Sigma Lambda Gamma, Alpha Pi Sigma, Sigma Lambda Beta, Lambda Theta Phi, and Omega Delta Phi. The five NPHC Organizations are Delta Sigma Theta, Alpha Phi Alpha, Phi Beta Sigma, Zeta Phi Beta, and Iota Phi Theta. Eastern Washington University offers club, intramural, and varsity sports. Its twelve varsity men's and women's sports teams compete in the Big Sky Conference of the National Collegiate Athletic Association's Division I as the Eastern Washington Eagles. The most-prominent athletics facilities on campus are Roos Field, Reese Court and the Jim Thorpe Fieldhouse. 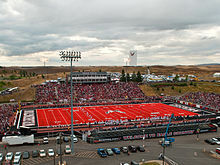 EWU has three national championships, including football (2010 – NCAA Div. I FCS), wrestling (1977 – NAIA) and men's cross country (1982 – NCAA Div. 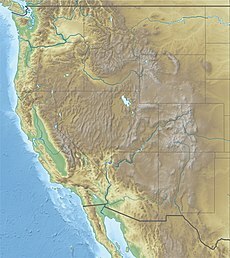 II). The Seattle Seahawks of the National Football League held the majority of their summer training camps at EWU, from 1976 to 1985 and again from 1997 to 2006, from late July to mid August. ^ "U.S. and Canadian Institutions Listed by Fiscal Year (FY) 2016 Endowment Market Value and Change in Endowment Market Value from FY 2015 to FY 2016" (PDF). Nacubo. Archived from the original (PDF) on April 2, 2017. ^ EWU Identity Standards (PDF). Retrieved March 29, 2016. ^ "EWU – Facts at a Glance". ewu.edu. ^ "EWU – About EWU". ewu.edu. ^ "EWU – CALE Home". ewu.edu. ^ "EWU – CBPA Home". ewu.edu. ^ "EWU – CSBSSW Home". ewu.edu. ^ "EWU – Academics at Eastern". ewu.edu. ^ "EWU – EWU Creates New College". ewu.edu. ^ Davis, Hugh (June 14, 1977). "Eastern changes few". Spokane Daily Chronicle. Washington. p. 19. ^ Emerson, Stephen (April 1992), National Register of Historic Places Registration Form: Washington State Normal School at Cheney Historic District (PDF), retrieved February 5, 2015 . ^ "EWU Off Campus". Retrieved November 1, 2018. ^ "EWU – Programs by College/School". ewu.edu. ^ "EWU | Academics at Eastern". Ewu.edu. Retrieved August 20, 2012. ^ "EWU | PUB". access.ewu.edu. Retrieved March 3, 2017. ^ "New tower dormitory for EWSC". Spokesman-Review. (Spokane, Washington). October 1, 1961. p. 1, sec. 2. ^ "New buildings near completion on EWSC campus". Spokesman-Review. (Spokane, Washington). (photos). September 2, 1967. p. 18. ^ "Apartments Eligibility". access.ewu.edu. Retrieved July 27, 2018. ^ "The Easterner: The independent, student-run news site of Eastern Washington University". Retrieved March 16, 2017. ^ "@TheEasterner". The Easterner. Retrieved March 16, 2017. ^ Perry, Rosie (October 6, 2016). "Editor's Note". The Easterner Vol. 100 (2). Retrieved March 16, 2017. ^ Weaver, Dan (October 2, 1983). "Local boy makes good". Spokesman-Review. p. D1. ^ Taylor, Ihsan. "Best Sellers – The New York Times". Nytimes.com. Retrieved December 11, 2013. Wikimedia Commons has media related to Eastern Washington University. This page was last edited on 20 April 2019, at 13:55 (UTC).